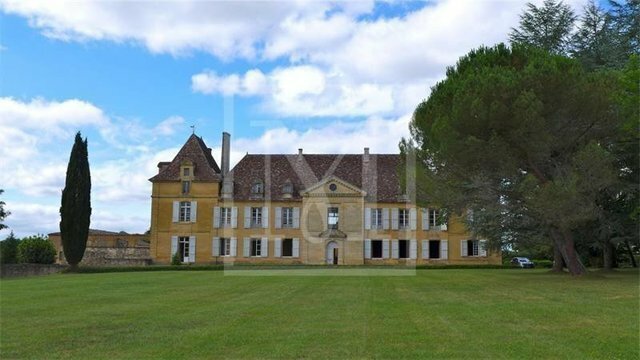 This late Louis XIVth style chateau built in the late 17th century/ early 18th century on a site dating from the XIII century is arranged around a court of honour with extensive period outbuildings. Also included in the domaine with a total of 190 hectares are two farms, a guardian's house, a XIVth century presbytery needing renovation, and a lake. The property is located in a peaceful spot conveniently 35 minutes from Bergerac airport. Chateau: The entrance to the chateau is through the court of honour, onto which three gates open. The chateau itself is composed of a central main building facing north-south, and two wings, one to the east, and the other larger wing to the west. Two corner pavilions finish the central body and are elevated in relation to it. To the west of the main courtyard is a service courtyard lined with two buildings. Ground Floor: The ground floor of the central building is served by a central hall with a main staircase that leads to the first floor. To the right of the entrance hall are two lounges, the second on the corner of the building. On the left there is a billiard room and an office in the corner served by a gallery located at the front side courtyard. The west wing consists of a dining room that communicates with the corner lounge. There is a service entrance with a staircase leading upstairs and communicating with the outside pool side. There are three vaulted rooms, one of which is cut in two and used as a kitchen. There is also an pantry on two levels behind the old ovens. The east wing has a winding corridor that serves a bathroom, toilet, bedroom and boiler room. At the end and independent is the chapel, overlooking the main courtyard. Courtyard building facing the central building: vaulted passage on one side and two vaulted rooms on the other. A large unconverted space on the first floor, lit by 6 windows overlooking the courtyard. Wing returning towards the entrance gate: two garages, three pedestrian entrances, and upstairs a vast, unconverted space, lit by five windows, four of which overlook the courtyard to the west. Service courtyard building: Old wine-making shed, in poor condition, and shed. Under the terrace of the swimming pool and connecting with the cellar located under the western part of the wing are outbuildings which have access on the west side. Caretaker's house: Perigordian style single storey house with a lounge, kitchen, three bedrooms, bathroom and shower room. Private garden with swimming pool and private access. Farms: A farm with a house, barn, shed, open barn and stables with 4 boxes in good condition. Second farmhouse with house and barn in poor condition. Fourteenth century Presbytery in front of the roman village church to renovate. Park and land: Total of 190 hectares. Pretty park around the chateau, very well maintained, with many ancient trees. Around 90 hectares of woodland and 100 hectares of fallow farmland. Lake of one hectare with between 5m and 10m depth and full of fish for fishing. Very quiet and peaceful situation. Listed as Historical Monument.